Slice a potato in half (lengthwise) and place a cookie cutter on cut side of one half. Place the other half aside for another stamp. Push the cookie cutter completely through the potato keeping it flat on the table and break away excess potato. Poke shape out of cutter and blot away any moisture with a paper towel. 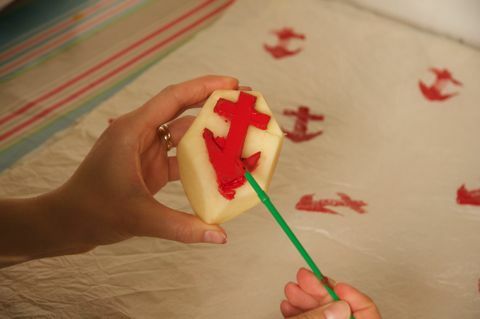 Spread a thin layer of paint on a paper plate and dip the potato (flat side down) into the paint. Gently shake off any excess paint and stamp away.